To attain high quality transformation of the body it was needed that the rig was composed not only with bones, but also with muscles. 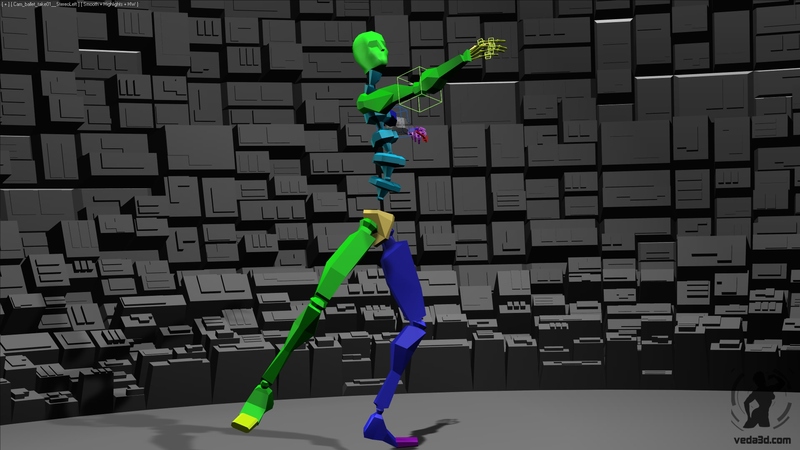 For the basic of skeleton was chosen Biped. The other variants were also considered. The CAT was rejected for instability of it’s work in the 2011,2012 versions of 3ds Max, while constructing of the skeleton with bones needed too much time for study and didn’t give any considerable advantages for creating my character. While creating muscles I considered different instruments – plugins such as CAT muscles, CAT muscle strand, SkinFX plugin, Hercules plugin, ACT plugin. During the process of acquaintance with the instruments I have worked out and written maxscript MuscleSelect, allowing quickly select a necessary part of the muscle which supports all mentioned above solutions. As the result of this selection were chosen CAT muscles, CAT muscle strand and SkinFX. The CAT Muscle Strand allowed to improve considerably the places of bending in shoulders, knees, elbows in comparison with using only Biped. Transformation of such muscles as biceps, triceps needed more complicated solution. The best solution turned out to be usage of modified CAT muscle strand with SkinFX. I also worked out and written scripted modifier, allowing to extent possibilities of CAT Muscle Strand and as well to correct some errors emerging while working with it. 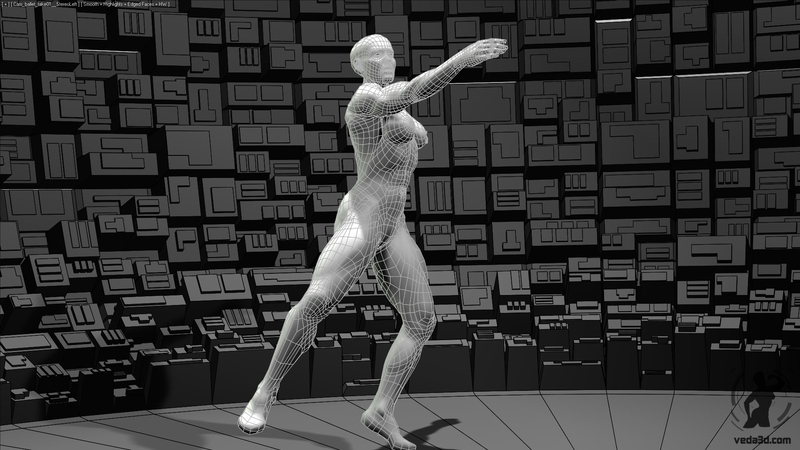 This movie shows you rig setup, which I have created for character (3d muscular girl) Veda. For skinning Veda I used Skin modifier, which allows reattach already skinned mesh even if the topology is changed. 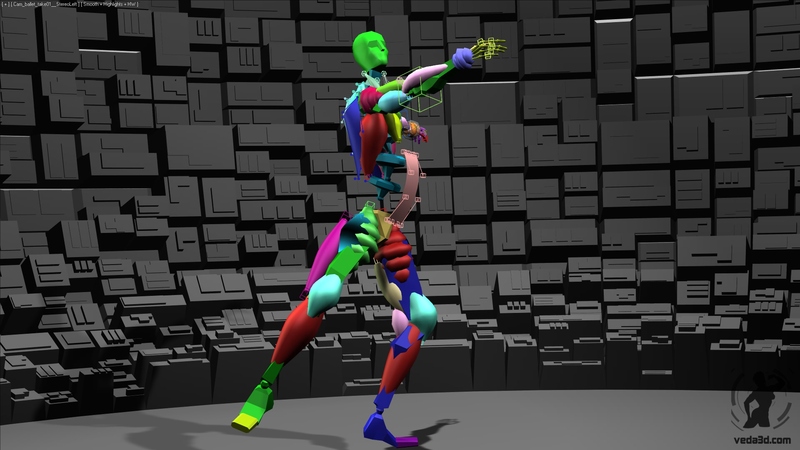 SkinFX plugin was used to attach muscles (modified CAT Muscle Strands) to the mesh. I had to modify SkinFX in order it could work with the CAT muscles strands and also to improve it. The main result of this improvement is possibility to reattach muscles to mesh. The mirror function of the SkinFX plug-in has been also improved. The result was the pipeline, allowing to correct topology and character model even at the final stage of animation and thanks to that to save time. Are you available for freelance work on a rig?